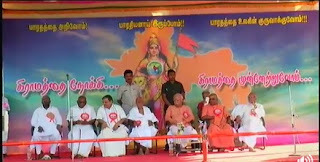 Nearly Five years walkthon by Shri Sitaram Kedilaya concluded today at Kanyakumari on the auspicious day of Gurupurnima. 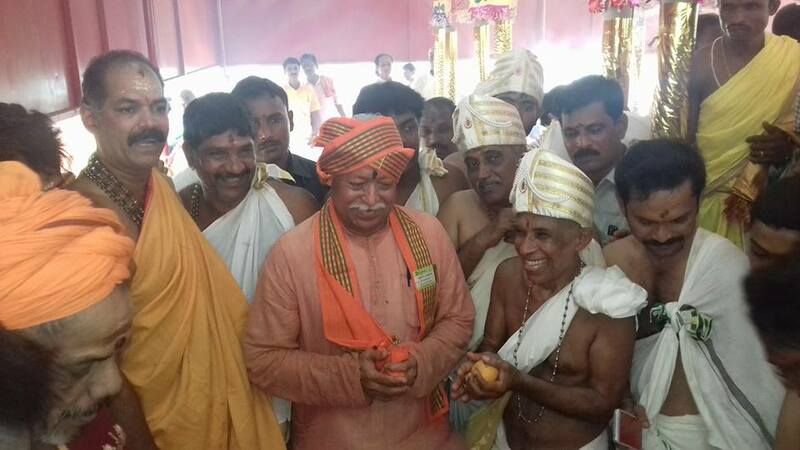 Shri Sitaram Kedilaya did Bharat Parikrama for 23100 kilometers in 2350 villages of 23 states. After completing his final day of walk in Kanyakumari, a special prayer was conducted at the Southern tip of Bharat followed with Dhwajaavataranam. 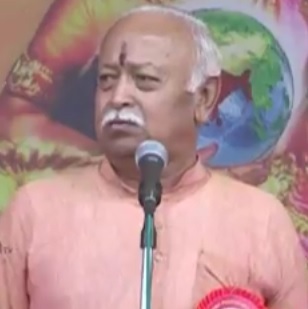 Later, a special Yagna ‘Vishwajigeeshu Yagna’ was performed by Shri Mohan Bhagwat along with Shri Sitaram Kedilaya and Shri Stanumaalayan. 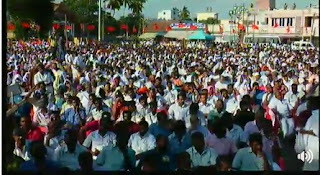 In the evening concluding ceremony was held at Nagaraja Thidal, Nagercoil wherein thousands of volunteers and public participated. 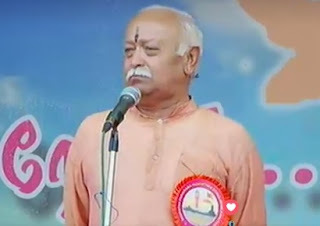 RSS Sarsanghachalak Shri Mohan Bhagwat, RSS Akhil Bharatiya Sah Sarkaryavah Shri Dattatreya Hosabale, VHP International Secretary Shri Champat Rai, Swami Chaitananda Maharaj, Vellimalai Ashram, noted film actor and Director Shri Visu, famous lyricist Shri Piraichudan and Shri Pon Radhakrishnan, Union Minister for Shipping, Road and Transport and other Sangh Adhikaris participated. The evening program begun with a melodious song. 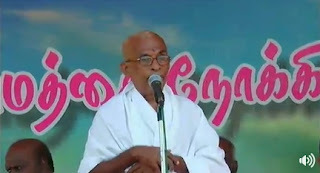 Blessing the gathering Swami Chaitanyananda Maharaj said that this Punya Bhoomi Bharatham is the land of great culture. He appealed the people and media to bring out the sacred divinity of our country. Many Saints like Adi Sankara, Swami Dayananda, Guru Nanak, Swami Vivekananda and Jains naturally did parikrama in our land. Likewise, in this Kaliyuga, this continuous walkathon gives one a great feel that the Nation is one in spite of various diversities, said Shri Champat Rai, VHP International Secretary. 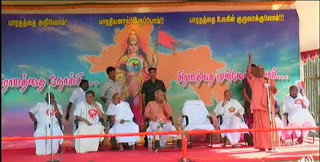 Shri Piraichudan in his address appealed the gathering to come forward to save our culture and nation. Patriotic feeling should be deep rooted and respected, he said. 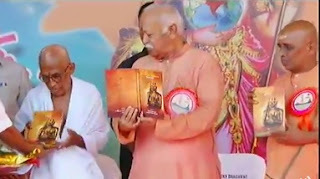 A book on Ramanuja was released by Shri Mohan Bhagawat and the first copy was received by Swami Chaitanyananda Maharaj. Shri Pon Radhakrishan, Union Minister for Shipping, Road and Transport wondered the success of the yatra. 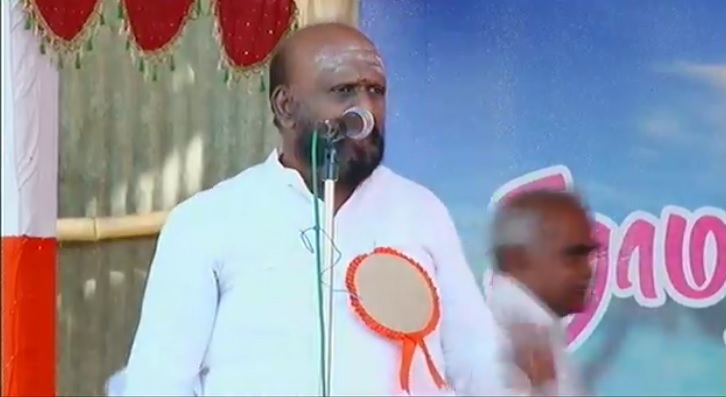 Pointing out that only a very few people were at the beginning and the support extending by the well-wishers is a vast one, and today thousands are receiving Sitaram Ji. Travelling one panchayat is itself a great task to us, but the lesson learnt from Swami Ji is that we should travel all 365 days to see and happen good deeds in the society. 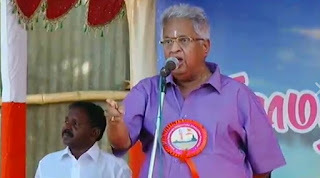 Actor, Director and multi-faceted Kalaimamani Shri Visu strongly raised his voice in support of Sangh in Tamilnadu. Many people questioned on his attending RSS function at Kanykumari. Questioning on them, he said ‘I will attend all RSS function, even if they say it as an extremist organization. I and we proudly say that we belong to Rashtriya Swayamsevak Sangh’. 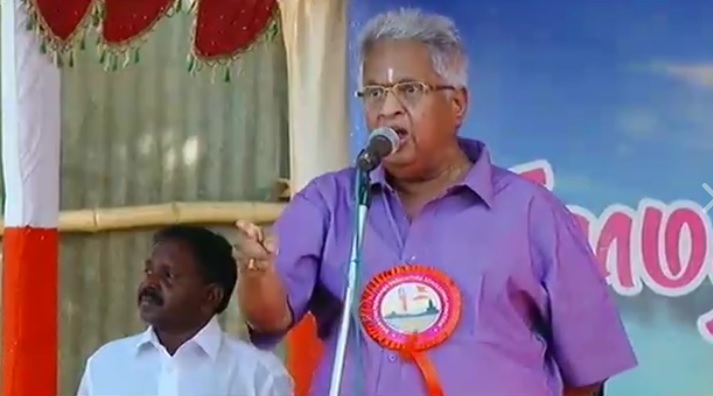 73 year old Visu said it is only this stage where I was not given script and attended the program in spite of illness and his wife presently at ICU. Shri Sitaram Ji thanked all the families, well-wishers, media, VSK Bengaluru, who extended support to make this Parikrama a great success. This Yatra makes one prarthana. Appealing towards village upliftment, he said sankalp towards making Bharat a Vishwaguru is to be taken forward. When this positive vibration prevails, we can move towards Satya Yuga, he said. It is this place where Swami Vivekananda started his journey to Chicago, same with Shri Sitaram Ji on Bharat Parikrama, could see this yatra a symbol of change. Started this yatra on Krishna Janmashtami day and ending it on this auspicious Guru Purnima day had shown the world that a significant transformation is possible by visiting each village. One faces many problems in life. To solve problems, we need to practice good deeds. If we examine our problems, various forms emerge. To put in a nut shell, Ego, Selfish attitude and discrimination among people compounds problems. It is only in Bharat, these problems are less compared to other countries. Ego leads to destruction; selfish attitude leads to corruption; and discrimination brings environmental problem. Focus on development only affects environment. All these problems are less in our country whereas other countries are facing a lot. We should bring development by protecting environment. Solution to this is protecting our culture, Dharma and this Dharma unites all of us among diversities. World respects only a cultured person than wealthy person. To benefit the society, we must take the sankalp of village development to make our country Vishwaguru. RSS Sarsanghachalak thanked all the well-wishers who extended their support to this Parikrama. 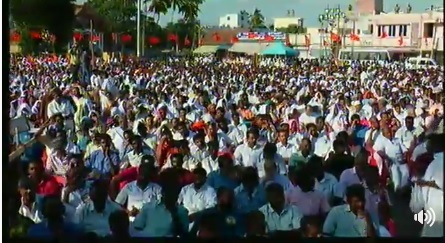 With a vote of thanks and Vande Mataram song, the program concluded with a huge gathering in Kanyakumari.